It may not be raining, but that doesn’t stop us from making these 20 unusual umbrella crafts for kids! From umbrellas that open and close to umbrellas that can be eaten – we’ve got it all! Ask any kid or adult about the basic image of a superhero and it’ll most certainly be one that involves a cape. However, one of my favorite superheroes is a lady without a cape – Mary Poppins. And guess what she uses to fly? An umbrella! When you think about it, you need an umbrella for all seasons. It protects you from falling snowflakes, from the summer heat and of course, the rain! But that’s just talking about regular umbrellas. Today, in honor of Umbrella Day which is coming up next month, we’re going to take a look at some not-so-regular umbrellas in our list of unusual umbrella crafts for kids! This craft from Hands on as We Grow is so easy, it’s literally as simple as 1-2-3! 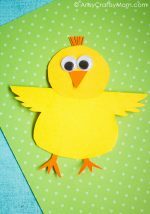 With chart paper, cupcake liners and pipe cleaners, you can make this project that even toddlers can help with! 3D crafts are so much more fun than the usual ones, right? 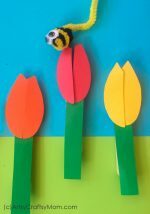 Crafty Morning has a 3D project that looks complicated but is really easy! The pleated paper makes a great umbrella and the little girl with the googly eyes is so cute! This is a pretty little craft to make with paper plates from Easy Peasy and Fun. The beading gives the kids some good motor skill exercise and the bright colors make this something that should go up on the wall or fridge. This is a great STEM idea for your toddler/preschooler to celebrate Umbrella Day. This simple activity promotes fine-motor skills and color recognition, and is really easy to setup! Give your windows a dash of color to welcome spring with a unique umbrella sun catcher craft from Sunny with a Chance of Sprinkles. Using coffee filters and colors, you can create something magical when it catches the sun! Want a craft project that looks realistic? You’ll love this umbrella craft from Mama Jenn – the raindrops look so real!! The idea of using glue drops and making them drip is just genius! Haven’t you always had those moments when you just wanted to close your umbrella and enjoy the rain falling on your face? Well, this craft from Krokotak captures that moment beautifully – from the umbrella’s perspective!! You know those red balls of Baybel cheese you see at stores? Well turn them into some adorable cheese umbrellas that make the perfect healthy snack for kids! Visit Cute Food for Kids for more details. 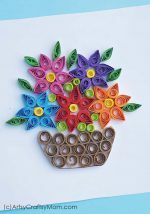 This is a lovely little craft project for a day when you have nothing particular to do! It uses supplies that you can easily find at home and put together. Great project for preschoolers! Always wanted to make your custom umbrella? Well, here’s your chance! Krokotak has a free printable umbrella craft that you can download, print and make your own! The instructions are pretty basic, and the finished umbrellas are beautiful! These little folded paper umbrellas from One Little Project are just too adorable for words! The instructions have been laid down very clearly, so you can make them without trouble. A glue gun would be helpful for this project. We love it when you can mix fun and learning in a single project – especially when it’s as colorful as this one from The Classroom Creative! Teach kids about word families with this craft – great for homeschoolers! 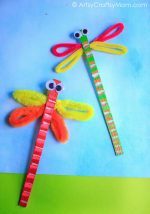 Here’s a lovely little craft from The Pinterested Parent to involve the little ones! Construction paper and buttons come together in this delightful work of art that deserves to be framed and hung up! If you’ve been looking for a way to teach the kids about the color wheel, then Tiny Art Room has an easy and colorful idea. We think that the idea of turning an umbrella into a color wheel is just genius! While we’re talking about umbrella crafts, why not make your own customized umbrella? Sugar and Cloth shows us how to make an umbrella featuring abstract art. All you need is a white umbrella and your imagination! This is a super easy project for kids – and you! Download and print out the free printable. Cut out the pieces and let the kids color in anyway they want. Then comes the fun part – assembly! Make your umbrella craft and eat it too! Little Food Junction has put together a beautiful edible umbrella craft made with healthy ingredients! A great way to get the kids to eat some fruit! Isn’t Origami fun? Especially when they can be played with! Neesly has a video tutorial that shows us how to make these cute umbrellas that aren’t just ornamental, but can be opened and closed as well! We’ve got Valentine’s Day and Mother’s Day all coming up in the next few months and here’s a great way to show your love – by showering it on your loved one! 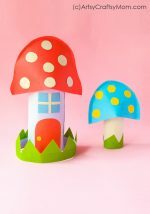 This cupcake liner umbrella craft from I Heart Crafty Things is an easy one for the little ones to try. Okay, these fruit slice umbrellas should become the coolest trend this summer! Studio DIY’s project is just awesome and I’m having a hard time deciding which one to make! 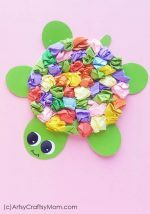 We don’t know what the weather is at your place, but we’re pretty sure you’re not going to wait for it to rain to start making these umbrella crafts for kids! Let us know which ones you liked best!